LONG PLAYTIME:Built-in high capacity battery,support for music playback 3-5 hours (determined by volume and audio content) . 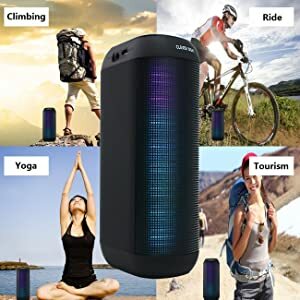 High quality bluetooth speaker with DSP that adds power to music. A compact body can not be imagined, realizing a dull sound. You can feel relaxed and low-pitched bass from a remote place. 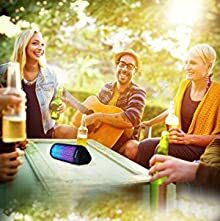 Enjoyable Music Venture: Portable design make this wireless stereo speaker is really convenient to take wherever you go.Play your favorite tunes on the go in clear, full audio. 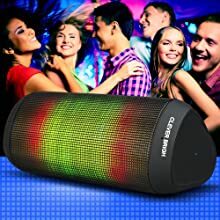 This is a type of CLEVER BRIGHT (CB-XY006) LED light Wireless Bluetooth Speakers. The speakers of CLEVER BRIGHT use advanced Bluetooth 4.1 technology, you can connect wirelessly without wires.It be paired with smartphones, tablets and music players can end in seconds. According to advanced technology, you can enjoy high-fidelity stereo sound quality. ♫ The forth, light look like circle bubble. The speakers of CB-XY006 use advanced Bluetooth 4.1 technology, has powerful stereo sound, so you always enjoy the high-definition metal bass and subwoofer sound brought wonderful enjoyment ! AUX input, Hand-Free Calls, 33ft transmission, Extended Compatibility. It is small, does not occupy space, you can carry. 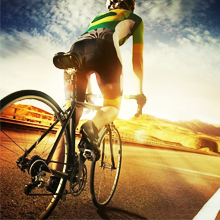 Does not require long audio cable, no external power supply. Built-in lithium battery can make the Bluetooth audio run for a long time, readily let it into the bag, you can easily go out. How enjoyment to listening music and watching the beautiful view are! CB-XY006 Wireless Bluetooth Speaker applies to video, games, gatherings, parties, bars etc any place where you want! The multiful style of LED Light like you had went into the bars. Yes, you can use it on bars. The high quality subwoofer sound and it cool colors let CLEVER BRIGHT Wireless Bluetooth Speaker looks more excellent ! Use more than one CLEVER BRIGHT speakers, you will have stereo sound, clear sound, no way inferior to the bars. When the family dinner, friends party, its high quality and colorful colors for the party adds an irreplaceable and active element. 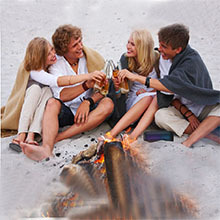 It has become an indispensable partner to contemporary social gatherings. 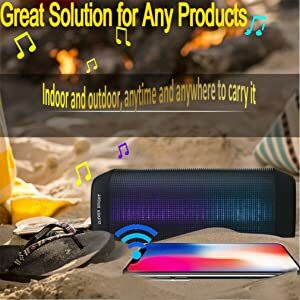 This wireless portable speaker has super stereo and loud HIFI sound, not matter riding, in the off-road, driving or sleeping in car, you can listen it clearly and feel comfortable, can not affect your nice time of enjoy the music. CLEVER BRIGHT must give you a good mood! High quality, Seiko secret agent, to the world !